Gerald Jermaine Wallace (born July 23, 1982) is an American professional basketball player who last played for the Boston Celtics of the National Basketball Association (NBA). He played college basketball with Alabama. Wallace attended Childersburg High School in Childersburg, Alabama, where he had a very successful career. For his senior season efforts, he was named the Naismith Prep Player of the Year, an honor given to the best high school basketball player. Wallace attended the University of Alabama for one season before declaring himself eligible for the 2001 NBA draft. In 2000–01, he averaged 9.8 points and 6.0 rebounds per game. In three seasons with the Sacramento Kings, Wallace rarely played, but in his brief appearances, he made himself known for his versatility and extraordinary athleticism. In the 2002 Slam Dunk Contest, Wallace finished second to two-time winner Jason Richardson. During his tenure with the Kings, Wallace was the odd man out in a deep roster that included All-Stars Chris Webber, Peja Stojaković, Vlade Divac, Hedo Türkoğlu and Brad Miller. Wallace was selected by the Charlotte Bobcats as part of the 2004 NBA Expansion Draft. He would start immediately for the club, and went on to have a season of averaging 11.1 points, 5.5 rebounds, 1.7 steals and 1.3 blocks a game. He continued to improve in 2005–06, before getting injured in January, averaging 14.5 points and 7 rebounds, and ranking in the top 10 in the NBA in field goal percentage (54.142), blocks (2.19), and steals per game (2.44). Since the NBA began counting blocks as a statistic in 1973, only two other players (David Robinson and Hakeem Olajuwon) in league history have averaged over 2.0 blocks and 2.0 steals per game in a single season. Wallace is known for his somewhat reckless style of play that leads to his frequent injuries. For this, he has earned the nickname "Crash". He missed a total of 39 games in his first two years with the Bobcats, but his energetic and sometimes dangerous behavior that may have caused his injuries was also what contributed to his gaudy defensive stats. Coach Bernie Bickerstaff said of Wallace "Gerald can only play one way and be effective. Energy -- that's his game." In 2006, Wallace attempted to refine his game in order to avoid being injured, and as a result his numbers suffered. The first month of the season, Wallace had only five total blocks (an average of 0.3 per game) and his averages were down across the statline from 2005. Wallace improved his play in the second month of the season, but he went down with a separated shoulder in a December game against the Indiana Pacers. When he returned, Wallace continued his fine play finishing the season averaging 18.1 points, 7.2 rebounds, 2.6 assists, 2 steals, and 1 block in 72 games. Wallace appeared opposite Tim Duncan in the March 2008 "SLAM-UP" centerfold for SLAM Magazine. Wallace suffered a Grade 3 concussion on February 23, 2008 after taking an unintentional elbow to the face from Sacramento's Mikki Moore. It was his fourth concussion in as many seasons with the Bobcats. It was not clear when he would return, although Grade 3 concussions are defined by the American Association of Neurological Surgeons as ones that "involve post-traumatic amnesia for more than 24 hours or unconsciousness for more than five minutes. Players who sustain this grade of brain injury should be sidelined for at least one month, after which they can return to play if they are asymptomatic for one week." He returned later on in the season, finishing the year with a new career high in points, assists, and minutes. He suffered a partially collapsed lung and a fractured rib after being flagrantly fouled while driving for a layup by Los Angeles Lakers' Andrew Bynum on January 27, 2009 and was forced to miss seven games. He also was unable to fly and instead crossed the United States en route back to Charlotte by bus. Wallace was selected to play in the 2010 NBA All-Star Game in Dallas, becoming the first and only Charlotte Bobcat to do so (with the Bobcats changing their name to the Hornets in 2014). Wallace was also selected to participate in the 2010 NBA All-Star Weekend Slam Dunk Contest. He was also selected to the 2010–2012 USA Basketball Men's National Team to represent the United States in the 2010 FIBA World Championship along with a possible trip with the team to the 2012 Olympics. In the first-ever playoff game for the Bobcats, Wallace led the team with 25 points. This franchise playoff single game scoring record lasted until game 2 of the series, when Stephen Jackson broke the record by scoring 27 points. In 2010, Wallace was named to the NBA All-Defensive First Team. During the 2010–2011 season as a Bobcat, he averaged 15.6 points per game, 8.2 rebounds per game, and 2.4 assists per game in 39 minutes per game. He played 48 games with the team during the season. 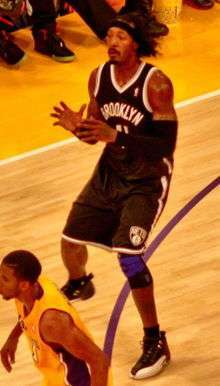 On February 24, 2011, Wallace was traded to the Portland Trail Blazers for Joel Przybilla, Dante Cunningham, Sean Marks, and two future draft picks. He provided help for the team while Brandon Roy was injured. The Trail Blazers finished 48-34, good for the playoffs. They lost in the opening round to the Dallas Mavericks in 6 games. In the next season as a Trail Blazer, Wallace averaged 13.3 points per game, 6.6 rebounds per game, and 2.7 assists per game in 35.8 minutes per game. He played 42 games with the team that season. On March 15, 2012, Wallace was traded from the Portland Trail Blazers to the New Jersey Nets in exchange for Shawne Williams, Mehmet Okur and a 2012 top-3 protected 1st round draft pick. On April 8, 2012 Wallace injured his left leg on a put back dunk. Wallace would only play 2 more games the entire season. Wallace played in 16 total games for the Nets that season and averaged 15.2 points per game. On July 11, 2012, Wallace re-signed with the Nets. The contract is reportedly worth $40 million for four years. In the first game of the season Wallace injured his left ankle. With just 27 seconds left on the game clock, Wallace got hurt trying to block a shot by Raptors point guard Kyle Lowry. After the game the team announced it was a sprained left ankle. Wallace would miss 6 games before making his return. Wallace would get injured again when the Nets played the Phoenix Suns on January 11, 2013. Wallace injured his ribs after the Phoenix Suns player P.J. Tucker fouled him hard while attempting a fast break dunk early in the first quarter. Wallace landed awkwardly on the floor and remained on the court for several moments before being helped to get on his feet and to the locker room. He did not return to the game. Gerald would miss 2 games until he returned to play the Atlanta Hawks. Wallace was traded to the Boston Celtics on July 12, 2013, in a multi-player deal that sent Kevin Garnett, Paul Pierce, and Jason Terry to the Nets. On February 28, 2014, Wallace was ruled out for the rest of the season after an MRI revealed a torn meniscus in his left knee. On July 27, 2015, Wallace was traded, along with Chris Babb, to the Golden State Warriors in exchange for David Lee. Four days later, Wallace was traded to the Philadelphia 76ers, along with cash and draft considerations, in exchange for Jason Thompson. On September 27, 2015, he was waived by the 76ers. Wallace is represented by agent Rob Pelinka. Wallace started The Gerald Wallace Foundation to provide opportunities for underserved children and their families in his hometown of Childersburg, Alabama, and his former playing city of Portland, Oregon. ↑ "Gerald Wallace NBA & ABA Statistics". basketball-reference.com. Retrieved November 28, 2015. 1 2 3 4 "Bobcats reach out to NFL's Panthers for help with Wallace's concussion". ESPN. February 26, 2008. Retrieved February 26, 2008. ↑ "Occupational Hazard: Updates on Yao, Butler, G. Wallace". ESPN. February 29, 2008. Retrieved February 29, 2008. ↑ "Wallace injured in collision with Bynum". ESPN. January 28, 2009. Retrieved January 28, 2009. ↑ "Gerald Wallace All-Star profile". NBA.com. April 12, 2010. Retrieved April 12, 2010. ↑ "Gerald Wallace named to USA national team". AL.com. February 13, 2010. Retrieved September 27, 2015. ↑ "Orlando's Howard, Boston's Rondo lead All-Defensive Team". NBA.com. May 5, 2010. Retrieved May 5, 2010. ↑ "Trail Blazers Acquire Gerald Wallace" (Press release). Portland Trail Blazers. February 24, 2011. Retrieved February 24, 2011. ↑ Marc Stein (March 16, 2012). "Nets agree to acquire Gerald Wallace". ESPN. Retrieved March 16, 2012. ↑ "Gerald Wallace soars for huge put-back dunk, injures left leg on the landing (VIDEO)". yahoo.com. yahoo. April 9, 2012. Retrieved April 9, 2012. ↑ "Brooklyn Nets Re-Sign Gerald Wallace". NBA.com. July 11, 2012. Retrieved July 11, 2012. ↑ "Gerald Wallace playing through pain for Brooklyn Nets, admits to physical and mental slump". New York Daily News. nydailynews.com. February 27, 2013. Retrieved February 27, 2013. ↑ Patt, Jason (January 12, 2013). "Gerald Wallace injury: Bruised ribs for Nets forward". sbnation.com. sbnation. Retrieved January 12, 2013. ↑ "Celtics Complete Trade With Brooklyn Nets". NBA.com. July 12, 2013. Retrieved July 12, 2013. ↑ "Celtics Slammed With Laundry List of Injuries". NBA.com. February 28, 2014. Retrieved March 1, 2014. ↑ "Gerald Wallace's season likely over". ESPN. February 28, 2014. Retrieved March 1, 2014. ↑ "Celtics' Gerald Wallace (knee) done for the season". CBSSports.com. March 1, 2014. Retrieved March 1, 2014. ↑ "Warriors Trade David Lee to Boston in Exchange for Gerald Wallace & Chris Babb". NBA.com. July 27, 2015. Retrieved July 27, 2015. ↑ "Sixers Acquire Gerald Wallace And A Draft Consideration". NBA.com. July 31, 2015. Retrieved July 31, 2015. ↑ "SIXERS ANNOUNCE 2015 TRAINING CAMP ROSTER". NBA.com. September 27, 2015. Retrieved September 27, 2015. ↑ "Rob Pelinka". DraftExpress LLC. Retrieved July 23, 2008. ↑ Murray, Malinda (January 26, 2008). "Wallace Launches Foundation To Help Shape The Lives Of Kids In Need". Archived from the original on February 3, 2014. Retrieved May 10, 2011.